The cover image from Mexican Pulp Art. This is the 205th in my series of Forgotten Books. This will be a relatively short review because the book is short by itself. This volume collects cover illustrations from a variety of Mexican pulp magazines over 134 pages. Some are one page or smaller, though there are several double page spreads. The pictures are from the collections of Bobbette Axelrod and Ted Frankel. The introduction contains a little on the history of Mexican pulp magazines. According to the introduction, at their peak the Mexican pulps were being printed in amounts of 50 to 80 million per month! The photos are from the 1960’s through the 1970’s. Not a lot is known about the artists since, as in the US, these were disposable items, meant for momentary amusement and then the ashcan. Dinosaurs attack in Mexican Pulp Art. The artists are primarily known by the last names shown on the paintings. 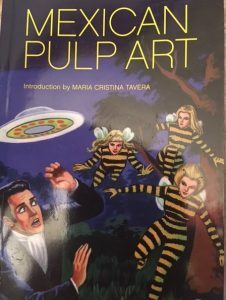 There does not appear to be anyone equivalent to J. Allen St. John, Rafael deSoto, Norman Saunders, Margaret Brundage or Hannes Bok, among the many others who graced the American pulps, but there are some gems here, including the lovely bee woman cover featured on the cover. I have included some random shots I took from the interior of the volume. My only complaints are the size of the book and just nine pages of text,. It is barely larger than a mass market paperback. I would have loved to have seen a large trade paperback or art book to revel in. I would have loved more on the Mexican pulp industry, perhaps something about recurring characters or about how the two collections were acquired and evolved over the years. I will take what I got, though. Check out these photos and let me know your thoughts. 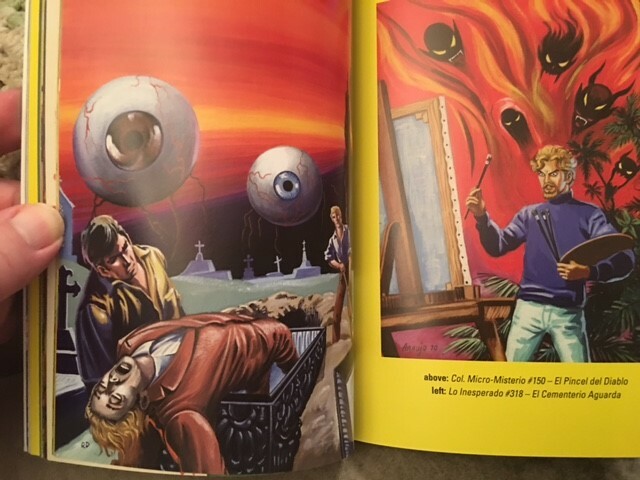 Strange things are afoot (and aneyeball) in Mexican Pulp Art. 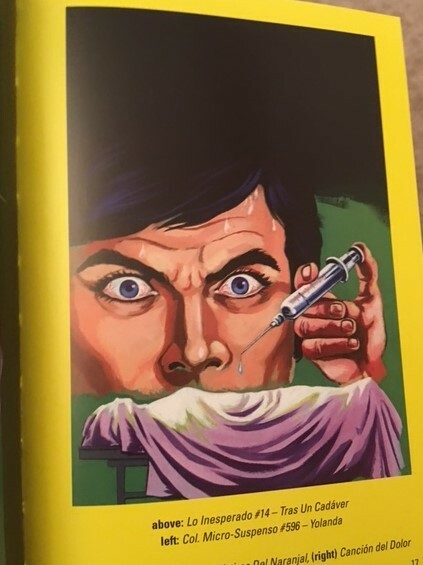 Another of the ghastly images from Mexican Pulp Art. Kongo – The Gorilla Man was a strike out, even for this gorilla fan. This is the 194th in my series of Forgotten Books. I am a monkey and ape fan. I say it proudly, claiming King Kong as my favorite film. 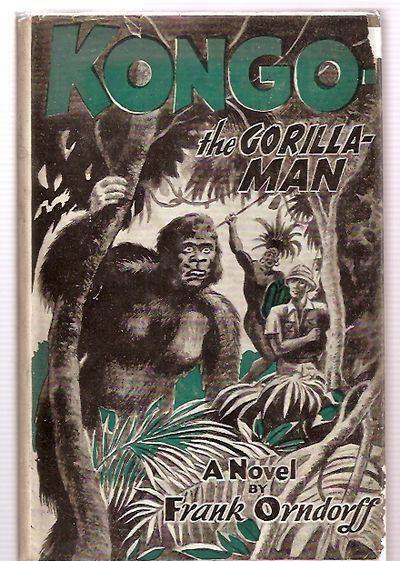 I was alerted to the novel Kongo – The Gorilla-Man by Jess Nevins, who informed a select group of monkey fans with a picture of the dustjacket and asked whether anyone of us had ever read or heard of it. No one had, but I checked out American Book Exchange (ABE) and found a copy in fair condition for under $20, including shipping. The primitive looking cover and the scarcity of the title sealed the deal. When the book came in, I posted on Facebook and Todd Mason urged me to include it as a Friday Forgotten Book. I had been planning on returning to the FFB fold anyway, so between Robert Bloch’s Centennial and this novel, I was enticed to return. What can I say about Kongo? I read it. If I was a sadist or horrible person, I would urge you to do the same, but I’m not. ABE shows five entries for Frank Orndorff, including two copies of Kongo, The Truth About the Bible, and two copies of Amazing Stories Quarterly, Volume 1, #1 from 1928. Other sites did not reveal any additional titles. So, not a prolific writer. But that’s not the issue here. This novel is a mess. The plot takes several paths, but essentially starts with a majestic white eagle sailing over the African continent with a priceless diamond around its neck. Various groups are looking for it. There’s the team of Harry Van Hall and his friend Jack, two men searching for game and the white eagle. There’s the villainous team of The Brut and The Weasel. There’s the tribe of gorillas, led by Kil. And there are various African natives, some good, some bad. Harry and Jack kill a gorilla one day. This gorilla was Kongo-go, or “Kongo the coward” in gorilla speak. To amuse the natives, Harry dons the gorilla pelt and is performing in it when tthe group of gorillas led by Kil attacks the camp. Harry is knocked in the head and loses all sense. He believes that he is a gorilla and part of the tribe. The others notice that he smells odd, but accept him as one of their own. As the coward, he is the last to eat if he is even allowed. Harry does not remember his old life, but he understands gorilla speak. As in 2001: A Space Odyssey, he discovers the use of a club and works his way up in the tribal organization. The Brute and The Weasel find the large diamond which has worked its way to a tribe. The king of the tribe wants to kill them, but the two use their white man’s magic to play for time and to try and get the diamond, which the natives do not value. Their only problem is that the king is not honorable and really wants nothing more than to kill them for their supplies. Still, though, he is fascinated by their magic and needs to learn it before he kills them. Then there are the Arab slavers and the lost rich white girl who is to be sold in slavery. Not to mention other characters and stories, all of which are pretty bad. The book had obviously not been proofread before publication, because words are used incorrectly. There are also many spelling errors and sentences which do not make sense. This book was a struggle, but I made it through. It is a young adult novel with little depth, motivation, characterization or reason for existing. It is not really a Tarzan rip-off as Harry has no real skills or jungle smarts. Let me just say, save yourself the trouble. It did not work for me and I don’t think it will work for you. 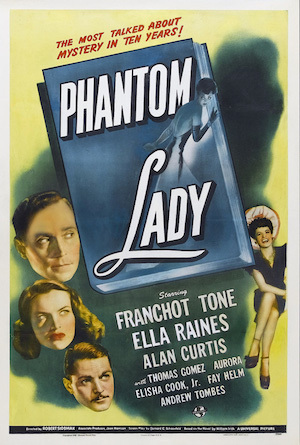 Cornell Woolrich's Phantom Lady is an engaging mystery film, just not a great one. I really love the novels of Cornell Woolrich, whether writing under that name or William Irish or George Hopley. For a while, I had a very nice collection of first editions of his work including a beautiful copy of Phantom Lady. But I took the money and ran a long time ago. Woolrich was a master of suspense and tension, particularly in his novels, though some also comes through in his films. Check out my review of Jacques Tourneau’s The Leopard Man which was based on Woolrich’s novel Black Alibi. It features one of the most terrifying scenes ever put on screen and that scene is straight out of the novel. But, let’s talk about Phantom Lady. Scott Henderson (Alan Curtis) is a successful engineer in a bad marriage. On his anniversary he and his wife have a fight and he storms out of the apartment. He goes to a local bar where he meets a lonely woman with a gaudy hat. They make small talk and he invites her to go to a show. When he asks her name, she demurs, saying that they should enjoy the night with no names and no history. They take a cab to the show where a drummer tries to get her attention and the headliner Monteiro (Aurora) is seen wearing the same hat. Monteiro is obviously furious. Henderson returns home to find police Inspector Burgess (Thomas Gomez) waiting. Henderson’s wife has been strangled with one of his neckties. Henderson isn’t worried about being arrested for the crime because he didn’t do it. But when the police question the bartender (Andrew Tombes) he says Henderson was alone. So does the cab driver. And when Monteiro is questioned, she remembers nothing about the Henderson’s companion and the hat the argued about isn’t even among her costumes. Henderson finds himself on trial for murder and, with no alibi, he is quickly convicted and sentenced to die. The only one convinced he’s innocent is his secretary, Carol “Kansas” Richmond (Ella Raines), who is in love with him. She cannot find any other way to help him, so she shadows the bartender. When he makes a casual slip about being paid, he tries to attack her and ends up getting killed in traffic. At that point, Carol suspects she is on the right trail. She begins to track down the drummer (Elisha Cook, Jr.) who admits that he was paid $500 to forget what he saw. Carol calls Burgess, but by the time he gets there the drummer is dead. At this point, the film gives away the identity of the real killer, something which was not disclosed in the book until the very end. Scott’s friend, Jack Marlow (Franchot Tone) has been in South America and when he returns he agrees to help Carol solve Scott’s problem. Together they find the Phantom Lady and the hat, but the murderer is still about and Carol is in deep trouble. This was a good film, just not the great film which might have been made from the book. In glorious black and white, it has many of the features of a good noir film but somehow falls flat. The tense moments just don’t quite come across that way, until the point at which Carol confronts the killer. Part of the problem is the source material. Woolrich novels sometimes rely on coincidence and, as in this case, you have to buy that people are willing to let a man die after being paid to forget something. Somehow I tend to have a better opinion of people than that. Of the four, one should have broken down. When reading the books, the breakneck pacing gets you through. With the film, that pacing isn’t there and the flaws emerge. I still like this film, though, and I still love the work of Woolrich. I’m hoping you do to. TCM runs this film fairly regularly and you should check it out when you can. It’s not Out of the Past or Double Indemnity, but it’s still worthwhile. The "wrong man" suspense novel Run from the Hunter takes place around Mardi Gras in Mobile, Alabama, which makes it a fun, fast read for this time of year. This is the 176th in my series of Forgotten Books. As I write this, Mardi Gras is being celebrated across the country and in New Orleans with fine gusto. I have never been to the various parades and such since I dislike large crowds and drunken revelries as a general rule. But I have friends who are there right now collecting beads, listening to blues and jazz and eating some mighty fine food. 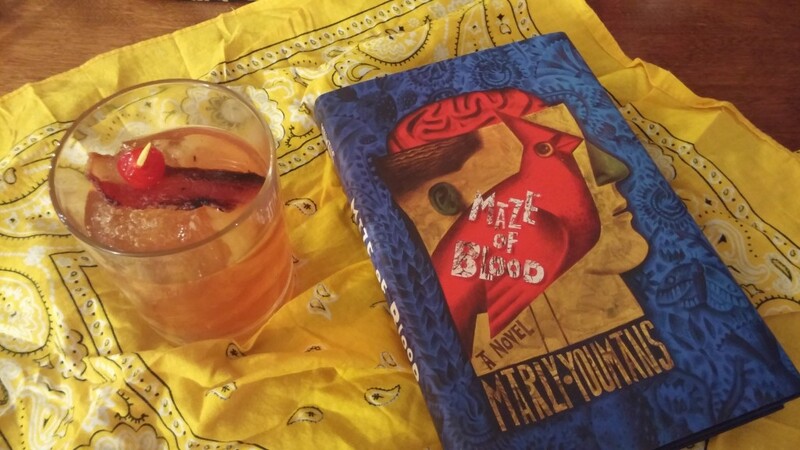 So I decided to celebrate Mardi Gras in a different way by reading a mystery set during Mardi Gras, though in Mobile, Alabama. In Run from the Hunter, Chris Adams is a former columnist for the Mobile Messenger who has been convicted of killing his former girlfriend Steffany Fontaine. There seems to be a motive, since she was running around on him. Adams is innocent and a bartender should have provided the alibi, but, for some reason, the bartender lied and now Adams is on his way to prison via railroad. Mobster Frank Giogio is on the same train with the same destination intended. But he confides in Adams that the train will be derailed in four minutes. Adams tries to alert the police who do not believe anything he says. They should have listened. Giorgio is killed when the bridge over the swamp is blown up, as are several policemen. But Adams survives and manages to get the handcuff key and escape into the dark and the bayou. The police are definitely going to be following him. In the darkness, he manages to find a run-down house and takes shelter. But he is soon surprised by a young woman with a rifle. His case is now well known and the young woman, Loni Gaillard, recognizes him. And so does her mother. Adams tells his story and Mrs. Gaillard believes him. Besides, the rifle has no bullets. Adams is allowed to sleep the night before he’s sent to see Jericho, an old man who agrees to help him. Jericho has an old Deusenberg that they use to go back to Mobile. Meanwhile, tracking Adams is Lieutenant Carr, the police homicide detective who built the case against him. Turns out, Carr was also one of Steffany’s suitors. He took her death pretty badly and has vowed to track Adams down. Since it’s Mardi Gras and Adams is afraid of being recognized, he and Jericho stop for costumes, a pirate costume for Adams and a skeleton for Jericho. Adams contacts his former boss, Sheridan “Sherry” Paige, for help. They track down the bartender to question him about his perjury, only to find him dead. Things seem to be progressing poorly for Adams as the police keep getting closer and closer. Run from the Hunter is a pretty nice suspense and mystery novel, which Beaumont began but turned over to his friend Tomerlin to finish. The duo worked together on the final draft and polish. The original edition was published by Gold Medal under the Keith Grantland name, which Tomerlin says in his introduction to the Centipede Press edition was from the middle names of each of their sons. There were two printings from Gold Medal and a hardback edition in the UK from Boardman. I’ve had both the Gold Medal printings, which had different covers, and I recently acquired the Centipede Press edition, which is very nice and contains a decent short story, “Moon in Gemini,” by the pair. I have read a lot of Beaumont’s short fiction. I’ve got his solo novel The Intruder, which was filmed in the early 60’s with William Shatner in the lead. I haven’t read it yet, though it has a good reputation. The quality of Beaumont’s short work gives me hope for it. The film version was made by Roger Corman and is one of the few Corman films to not make a profit. IMDB shows a 7.8 out of ten rating for the film. Apparently Beaumont, William F. Nolan and George Clayton Johnson all have bit parts in it. Centipede Press also did a recent edition of that novel, which is the edition I have. They make very nice books. They are expensive but the quality that goes into the finished product is always worthwhile. So enjoy your Mardi Gras and have a wonderful weekend. Check out Run from the Hunter if you get the chance. It’s a worthy novel that deserves a larger audience. Nick of the Jabberwok is fast, fun and full of surprises. This is the 171st in my series of Forgotten Books. As I mentioned in the last Forgotten Book column, I recently discovered a cache of old Unicorn Mystery Book Club books at the local Half Price. I bought six volumes while I was there. The Memoirs of Solar Pons was in one of the volumes. 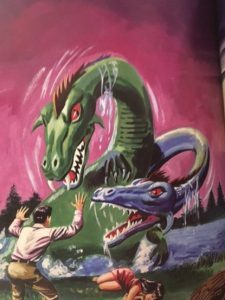 But the one that really pushed me over the edge was Night of the Jabberwock by Fredric Brown — not that it took much of a push. There was a time when I had a very nice collection of Fredric Brown’s work. I had hardback firsts of all his science fiction, including a nice, signed Space on My Hands and much of his mystery work. I believe I had all the mystery novels and most of the short stories. I did not have The Case of the Dancing Sandwiches, but I did have the original pulp that the story had appeared in. And I had read most of his work. Somewhere along the way, I did an article about Ed and Am Hunter that appeared in a non-fiction work about 100 great detectives, and I had read all those novels. At his worst, Brown was always worth reading. And at his best, he was fantastic. Here, in Night of the Jabberwock, he was at the top of his form. It’s a novel with a lot of stuff going on. The hero is Doc Stoeger, the editor and publisher of a small town weekly newspaper. He has a PhD and his dissertation was on Lewis Carroll. He is nuts for Lewis Carroll. But no one in the town really cares. He has one or two friends he can play chess with, but no one to really discuss the things he loves most. And after 23 years running the paper, he is down. Just once, he would love something to happen on Thursday night so that when the paper came out on Friday morning it would have real news. Well, Doc soon discovers you should be careful what you wish for. In the course of one night, he has many adventures. There’s a messy divorce case, the bank is broken into, several men are murdered, Doc and his friend Smiley are kidnapped by gangsters, there’s an explosion in the Roman candle department of the local fireworks factory, there’s an escapee from the local loony bin. Oh, and Doc is the prime suspect in two of the murders and is involved in a manhunt in his small town. Doc sees and witnesses all of these and yet, he cannot write about them. The series of events begins with a man named Yehudi Smith who asks about the Vorpal Blades, a Lewis Carroll appreciation society. That society wants Doc to meet them at a nearby haunted house to discuss the possibility that Lewis Carroll was writing about real worlds in the Alice books. This is fast paced like a Cornell Woolrich novel and, at times, just as unbelievable. But the prose is lean and clean, and the reader has the adventure of a lifetime. It’s a quick and wonderful read and, while it used to be impossible to find when I first started looking, there are plenty of editions and copies around online or in eBooks now. You have no excuse. Go forth and slay the jubjub bird and have some fun. Don't expect to use your logic muscles when you read the "Whispering Gorilla." This is the 157th in my series of Forgotten Books. My love of the gorilla in prose and film has been well documented in the various Forgotten reviews that I have done. 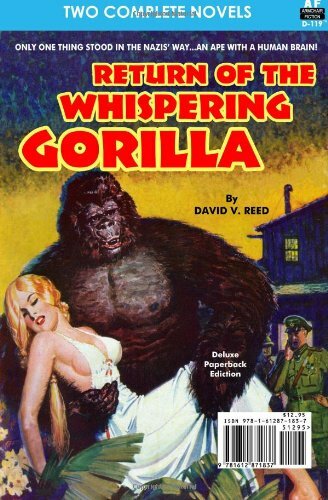 So, when Bill Crider reviewed The Whispering Gorilla a few months ago, I was intrigued. Particularly since the novel and its sequel were both readily available from armchair Press for a mere $12.95 with covers on both sides of the trade paperback, much like an old Ace Double, except the second novel and cover were not printed upside down. Ace reporter, Steve Carpenter, is stepping on toes and receiving death threats. He is investigating the rackets and their possible ties to Nazis! Carpenter is sent by his boss to Africa to hide out and continue writing his stories. But the mob has a hit man who takes his job seriously and he manages to track down Carpenter in Africa. Carpenter has found a refuge next door to scientist Dr. Devoli who is working on getting a gorilla to speak by modifying the voice box. The gorilla, Plumbutter, is responsive to the surgery. However, when Carpenter is killed, Dr. Devoli decides to go one further and transplants Carpenter’s brain into Plumbutter’s body. The transplant works and now Carpenter wants to return back to the U.S. to continue writing his expose. To do this, he convinces a Broadway promoter to star him in a play as the most amazing gorilla actor ever. Everyone knows that he must be someone in a gorilla suit, because gorillas cannot talk. He never appears out of the “suit” which creates publicity and gets on the radio under the pseudonym “W.G.” Clever. He fights the gangsters and the mob on the air and in the paper. He is once again a target but he is the 800 pound gorilla in the room. Gradually, he finds the transplant has some problems and Plumbutter’s body begins to invade his consciousness. With Devoli’s help, they manage to stop the Nazi threat. This sequel and its predecessor offer simian pulp fun. 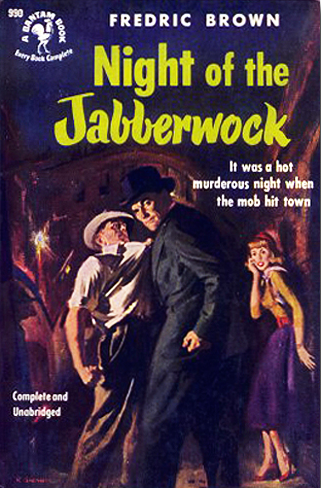 This first “novel” was written by Don Wilcox under the editorship of David V. Reed who worked hard with Wilcox in its construction. Later, Reed would write the sequel. Carpenter is still fighting his gorilla nature. He and Devoli are working in Africa. However, the drugs necessary to keep Carpenter in control are becoming harder to obtain because the World War is going on and the sanity doses are becoming less frequent. Carpenter is in communication with the local gorillas, whom he can understand. He is called Ologwa the Strange One and he tries to teach the gorillas how to control fire and other human traits. Since the World War features in here, we’ve got to have Nazis! And they show up with a beautiful girl in tow. They want Devoli to provide trained gorillas to pilot suicide mini-subs to throttle the Allies’ fleets. Ologwa is having trouble with hisz reasoning abilities and starts to work with the Nazis, but he fools them at the same time. This is pure pulp fiction. Logic is not going to work hard here, but I had fun. This has B movie written all over it and I am surprised one wasn’t made. It would have been great fun for America’s youth and the war effort. 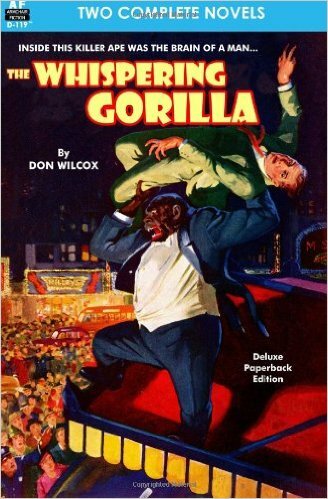 You are not going to confuse these books with anything written later than 1945, but if you’re in the mood for some wild gorilla action, they fill the bill. Check it out. Two pulp heroes square off in Doc Savage: The Sinister Shadow. This is the 154th in my series of Forgotten Books. 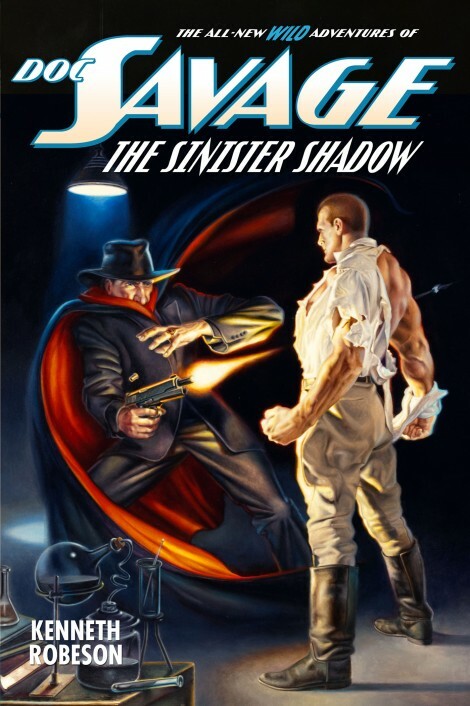 I was hooked as soon as I saw the cover – Doc Savage versus The Shadow. I have been a fan of both since the mid 1960’s, encountering The Shadow first in the Belmont series written by Dennis Lynds and Doc Savage when Bantam began it reprints. I found the Walter Gibson Shadow novels when Bantam (and later Pyramid) began the reprints of those early pulp classics. So, when Bill Crider offered me his copy of this fine book, I knew I would be reading it straight away. I was familiar with Will Murray’s Doc Savage adaptations (reviewing Skull Island a few years ago, where Doc Savage and his father ran into King Kong). The Murray work was great, building on the style established by Lester Dent (the real-life name of Kenneth Robeson, for 159 of the 181 novels in the original pulp series run). In this novel, Murray tries to capture the style of both Dent and of Gibson (who did at least 282 of the 325 The Shadow novels, published as by Maxwell Grant) as the viewpoints change throughout the novel. I started that evening. It was compulsive reading. Murray was familiar with much of the minutiae of each character, throwing the casual Shadow fan for a loop with the early kidnapping of Lamont Cranston and Doc Savage’s aide Theodore “Ham” Brooks. 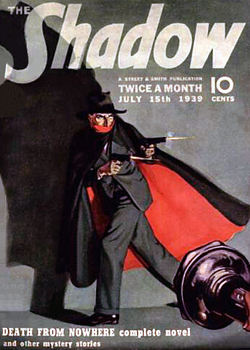 Lamont Cranston was a real New York millionaire that The Shadow had coerced into taking long vacations so that The Shadow could use his connections and identity. In this novel, the real Cranston is back and The Shadow is masquerading as George Clarendon. Cranston and Brooks are kidnapped as they try to reach Doc Savage. Cranston’s lawyer Sidney Palmer-Letts is killed outside of George Clarendon’s hotel room. Everything revolves around a mysterious blackmail note received by Cranston requiring $250,000 be paid or else he face dire consequences. Rich people around New York are dying of unexpected heart attacks. Doc Savage is convinced something sinister is going on. He and Monk Mayfair are the only ones of his crew in town and they are after this mysterious Shadow who may be behind the whole blackmail thing. Meanwhile, an evil villain known as The Funeral Director is plotting more. Twice he has evaded The Shadow and wants nothing more than his nemesis’ death. The action is fast and furious as The Shadow must avoid a hero as swift and brilliant as he is while trying to rescue Cranston and others. Sidemen such as Harry Vincent, Burbank and Clyde Burke assist The Shadow while Monk and Ham assist Doc Savage. The Shadow radio show appears as part of the plot, as does Doc Savage’s criminal rehabilitation facility where criminal tendencies are excised from the brain via surgery. Margo Lane (a radio creation not originally part of The Shadow’s team) is not seen in the book, which I thought was too bad. 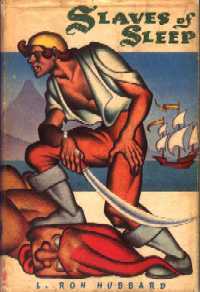 I loved this book, even though it was long (over 470 pages), which equates to between three or four Shadow or Doc Savage novels. When I finished, I was sorry it was done and wanted to be there for another 100 or more pages. This is the 152nd in my series of Forgotten Books. There was a time when Ron Hubbard was considered a very good writer of science fiction, fantasy, western, adventure and other types of pulp fiction. Then came the Dianetics and Scientology works and he entered into the religious field. Regardless of your opinions of his later efforts, his early writings contain some fine work. Never being one to refuse a book screaming to be read, I picked it up again. Instantly, I was back in its thrall. Jan Palmer is a young man who has a problem. He’s the head of a transportation company worth a lot of money and he has no interest in it at all. The business is run by his lawyer and business manager. Jan likes his books, boats and other stuff. He lives with his Aunt Ethel who respects the local mutts more than Jan. When visited by Professor Frobish, Jan finds himself with a problem. Frobish recognizes a large brass jar in Jan’s home as a sealed bottle containing an Ifrit, a type of genii. Jan refuses to let Frobish examine the bottle, so Frobish breaks into Jan’s home at night and breaks the seal on the bottle, releasing the Ifrit, one Zongri. Zongri has been imprisoned for many thousands of years. At first, he promised himself that he would reward anyone who released him with incalculable riches. Then he promises revenge on the human race. Zongri kills Professor Frobish and curses Jan to a life of eternal wakefulness. When the police arrive, Jan’s story is met with derision and he finds himself facing murder charges. Unwilling to lie, he is universally despised. The problems really escalate when he tries to sleep. Suddenly, Jan finds himself in a fantasy world where Ifrits flourish and he is known as a sailor named Tiger. He is in trouble in both worlds, facing certain death in either one. People from his Earth world seem to be prevalent in some form in the fantasy world. Living in both worlds, he gets no rest and is running ragged in both. It’s not a great novel or an important one, but it is fun. Some of the characters are stereotypes but I found I could not stop reading and enjoying it. The paperback I was reading reprinted some of Edd Cartier’s illustrations from UNKNOWN magazine which are quite fun. If this sounds like fun, check it out. There was a hardcover edition from Shasta Publications with a striking Hannes Bok cover. There is also a sequel MASTERS OF SLEEP which I have not read and cannot comment on. SLAVES has had several paperback editions, some in combination with the sequel. 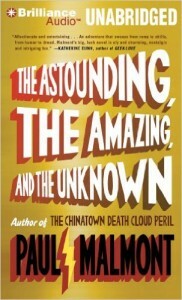 You might also check out THE ASTOUNDING, THE AMAZING, AND THE UNKNOWN by Paul Malmont which features Hubbard in a World War II adventure with Isaac Asimov, Robert Heinlein, and L. Sprague de Camp. It was quite a bit of fun, too.